ISC Results 2014 will be announced by Council for the Indian School Certificate Examinations (CISCE) at 17th May 2014 on 3:00 PM. 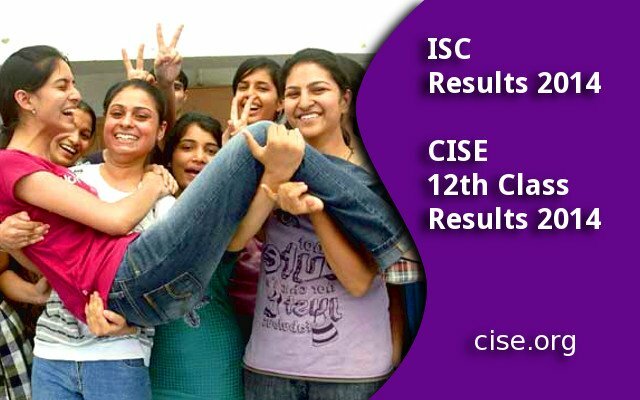 According to CISE The Results are available on cise.org after the official announcement of CISE 12th Class Results 2014. Students who appeared for ISC Exam 2014 can check results at the Council's website. Click on 'Results 2014' link and enter the Unique ID and date of Birth. Results will be available via SMS as well. To get CISCE result via SMS students must send a message in the following format i.e. ISC “SPACE” ROLL NUMBER and send it to 09248082883. ICSE schools can access the results by logging into the careers portal of the council using the principal's login ID and password. ISC Class 12 Exam 2014 conducted from February10, 2014 to April 11, 2014 after postponement due to Lok Sabha elections. The first paper of ISC examination 2014 was Art Paper- I and the last examination was for History. The ICSE Examination was conducted in 64 written subjects of which 23 are Indian languages and 12 are foreign languages.The ISC Examination has been conducted in 50 written subjects of which 14 are Indian languages and five are foreign languages and 2 classical languages. CISCE helpdesk is available at [email protected] or call 022-67226106. For ISC 2013 results in India, southern region has the best pass percentage i.e. 98.28 followed by Western region (97.17), Eastern region (95.29) and the Northern region (94.28). Abroad, ISC has achieved 98.31 per cent success. The results of ICSE Class 10 examination conducted by Council for the Indian School Certificate Examinations (CISCE) will be declared on May 21, 2014 at 3 pm. CISCE ,ISC Results 2014, CISCE Board, CISCE results 2014 / ISC class 12th result 2014/ISC Board 12th Result 2014 to be declared on May 17, 2014 AT 3PM.